James is startled when an axe is thrown past his vehicle and into a tree, which signifies he’s been challenged by a group of tough lumberjacks. Marsden accepts the challenge, with a certain amount of Hollywood charm. 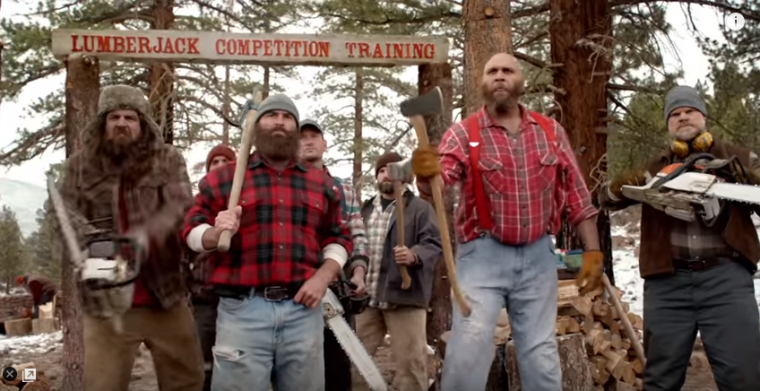 He then drives the lumberjacks to “Hard Knocks Canyon” where the narrator says “he would risk broken legs, losing limbs, and slipping and dying,” as the men teach the actor how to run on logs, climb trees, and cut wood. Marsden excels at every challenge and even pushes one lumberjack out of the way of a falling tree at one point, thus earning the man’s respect. Marsden was also given the lumberjack’s flannel shirt for comedic effect. 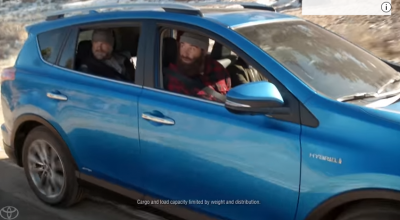 In the end, Marsden was able to show how far he was able to take his all-new RAV4 Hybrid, which was the point of the commercial; besides–of course–promoting Toyota’s new vehicle in entertaining fashion.